Democracy Plus (D+) published today a “Benchmarking Public Procurement” report. The analysis shows that out of the five municipalities they are monitoring, the best performing ones are the Municipality of Vushtrri/Vućitrn, followed by Prishtina/Priština and Peja/Peć, while Gjakova/Djakovica and Gjilan/Gnjilane scored lower than the others. 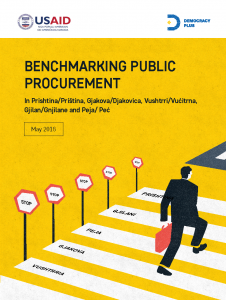 The purpose of this benchmarking report is to promote best practices in public procurement, to increase integrity, and to promote transparency and improve services for citizens. This report covers the period January 2017 to February 2018. Based on the analysis, the Municipality of Vushtrri/Vućitrn performs best among the five municipalities in this area of Implementation of Law. This is due to a high compliance rate with the legal framework while conducting procurement activities. The second highest scoring municipality is Peja/Peć followed by the Municipality of Prishtina/Priština. On the other hand, the Municipalities of Gjakova/Djakovica and Gjilan/Gnjilane scored lowest. Measuring “Good Practices” goes beyond basic legal obligations and assesses whether municipalities conducted market research, properly managed projects, and made payments on time. The best performing municipality is Prishtina/Priština – this municipality is applying standards for market research and for technical specifications in tenders and has also developed an Integrity Plan. The next municipality is Vushtrri/Vućitrn, which is one of the most disciplined municipalities in regard to executing payments within the legal deadline. The third best performing municipality is the Municipality of Gjakova/Djakovica, and the Municipality of Gjilan/Gnjilane scored just under Peja/Peć. This indicator measures the implementation of recommendations and opinions issued by the oversight institutions, such as the National Audit Office and Anti-Corruption Agency. The report found that these recommendations are best addressed and dealt with by the Municipalities of Prishtina/Priština, Vushtrri/Vućitrn, Peja/Peć and Gjakova/Djakovica. However, the Municipality of Gjilan/Gnjilane still has more work to do to implement these recommendations and opinions. Transparency is another important indicator. During the data analysis phase, D+ identified that the Municipality of Prishtina/Priština does not only share good practices in transparency but also has an ‘’Open Data’’ platform in place. This initiative indeed helps the citizens of Prishtina/Priština to stay well informed, as well as grant the private sector the confidence to apply for public tenders. The Municipality of Vushtrri/Vućitrn also scored high in transparency thanks to their commitment to open and accountable local governance. The Municipality of Gjakova/Djakovica has also shown efforts to ensure transparency in this sector. 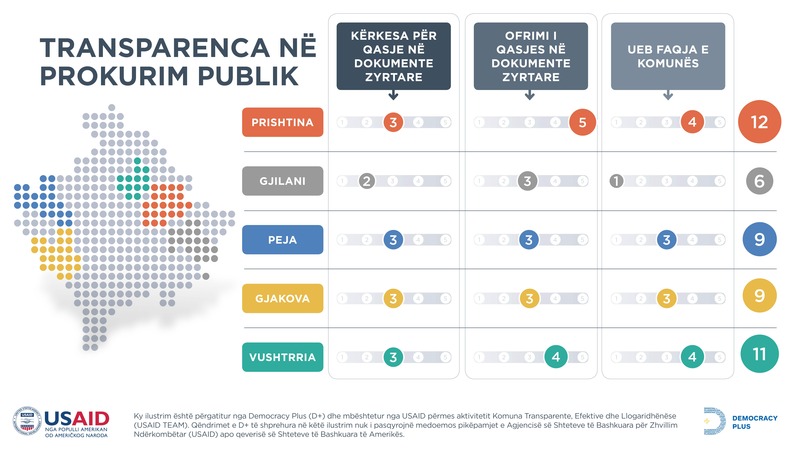 The Municipality of Gjilan/Gnjilane could improve its score in this indicator by allowing citizens to have better access to public information and improving its website, particularly the ‘’procurement section’. The 5th indicator looks at the fairness of competition in public procurement. The municipalities of Kosovo should implement all the necessary procedures to ensure that competition is not undermined by political affiliations, but only ruled by meritocracy and fair bidding. In this regard, the Municipality of Prishtina/Priština scores the best in comparison with the other four municipalities. The Municipalities of Vushtrri/Vuitrn and Gjakova/Djakovica are also not far behind in this section, as they also share sustainable practices to ensure that competition is carried out effectively. The Municipality of Gjilan/Gnjilane has good practices in place, but more could be done to ensure that activities are carried out by a number of different companies rather than engaging the same companies for simultaneous projects. The last indicator relates to civic engagement in the public procurement cycle. Citizens, CSOs, and media scrutinize the public procurement process, and it is within their rights to be informed and be involved in procurement activities that are carried by contracting authority. Municipalities should create opportunities for better coordination with citizens and involve them in processes that are of the public interest. Under this indicator, there was little difference between municipalities However, the Municipalities of Peja/Peć and Prishtina/Priština were found to be more engaged in informing their citizens. Regarding detailed results and graphic illustrations, please click here to download the report. This initiative is a result of the support of USAID’s Transparent, Effective, and Accountable Municipalities (USAID TEAM) activity to Democracy Plus.